Researchers at the McCormick School of Engineering are part of a team that has used stretchable electronics to create a multipurpose medical catheter that can both monitor heart functions and perform corrections on heart tissue during surgery. The device marks the first time stretchable electronics have been applied to a surgical process known as cardiac ablation, a milestone that could lead to simpler surgeries for arrhythmia and other heart conditions. The researchers had previously demonstrated the concept to apply stretchable electronics to heart surgery, but with this research improved the design’s functionality to the point that it could be utilized in animal tests. A paper describing the research, “Electronic Sensor and Actuator Webs for Large-Area Complex Geometry Cardiac Mapping and Therapy,” was published November 12 in the Proceedings of the National Academy of Sciences. Cardiac ablation is a surgical technique that corrects heart rhythm irregularities by destroying specific heart tissue that triggers irregular heartbeats. The procedure is typically performed either with open-heart surgery or by inserting a series of long, flexible catheters through a vein in the patient’s groin and into his heart. Currently this catheter method requires the use of three different devices, which are inserted into the heart in succession: one to map the heart’s signals and detect the problem area, a second to control positions of therapeutic actuators and their contact with the epicardium, and a third to burn the tissue away. “Our catheter replaces all three devices previously needed for cardiac ablation therapy, making the surgery faster, simpler, and with a lower risk of complication,” said Yonggang Huang, Joseph Cummings Professor of Civil and Environmental Engineering and Mechanical Engineering at McCormick. 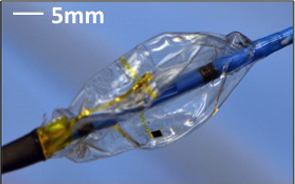 Central to the design is a section of catheter that is printed with a thin layer of stretchable electronics. The catheter’s exterior protects the electronics during its trip through the bloodstream; once inside the heart, the catheter is inflated like a balloon, exposing the electronics to a larger surface area inside the heart. With the catheter is in place, the individual devices within can perform their specific tasks. A pressure sensor determines the pressure on the heart; an EKG sensor monitors the heart’s condition during the procedure; and a temperature sensor controls the temperature so as not to damage surrounding tissue. The temperature can also be controlled during the procedure without removing the catheter. These devices can deliver critical, high-quality information — such as temperature, mechanical force, and blood flow — to the surgeon in real time, and the system is designed to operate reliably without any changes in properties as the balloon inflates and deflates. Researchers at McCormick led the efforts to design and optimize the system. (McCormick graduate student Shuodao Wang is a co-first author of the paper.) Device fabrications were done at the University of Illinois at Urbana-Champaign, and animal tests were conducted at University of Arizona Sarver Heart Center. Other partners on this research include Seoul National University in the Republic of Korea; the University of Texas at Austin; Zhejiang University in China; the Harbin Institute of Technology in China; the Institute of High Performance Computing in Singapore; Massachusetts General Hospital; and Tufts University.